MMA has come to fandejuegos to begin to train and fight in the great tournament of Mixed Martial Arts. Primea have to train to become familiar with the character and learn every move. Once you've learned all the movements will be ready to start fighting against the most dangerous fighters in MMA. This game is very addictive because it has a great simulation wrestling tournaments. Use the arrow keys to move to the indicated fighter. 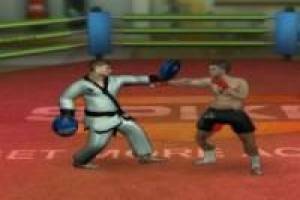 Enjoy the game MMA Mixed Martial Arts, it's free, it's one of our wwe wrestling games we've selected.